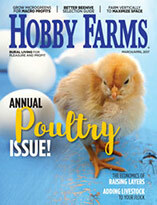 A veteran chicken-keeper answers questions about a chance discovery of excess eggs, "singing" hens and how much feed is too much. Q: When I went to collect eggs the other day, I noticed one of my chickens hiding in the corner of the coop. As she got up, I saw a hug pile of eggs—24 in all—in the straw. I have no idea how I didn’t see this before, as I collect eggs daily. So my question is: Do you think these eggs are safe to eat? I have no idea how long they have been there. A: There’s an easy way to tell how old an egg is. All you have to do is gently drop it into a glass of water. Eggs that sit on the bottom are very fresh. As an egg ages, air seeps into it through the pores in the eggshell, causing the egg to become buoyant. Eggs that are slightly older will start to rise up off the bottom of the glass at one end—the end where the air sac is—until, eventually, a very old egg will float. A floating egg isn’t necessarily an indication that the egg has gone bad, but I would toss out any floaters just in case. As for the other eggs, it’s likely they’re fine, but I would err on the side of caution there, too, and crack the eggs into a separate bowl, one by one, instead of dropping them directly into the frying pan or cake batter just in case. A rotten egg will look and smell bad. Q: I have been sitting in my chicken coop for hours to find out who is laying. I have noticed that when the chicken stands up to lay, another chicken that has been watching or waiting her turn will start singing. I’ve also noticed that after a hen lays an egg, she also start singing. Do you have any idea why they do this? But why do chickens feel the need to make such a fuss after they have laid an egg? Wouldn’t it make more sense for them to keep it quiet so predators—and humans who have a habit of stealing freshly laid eggs for their breakfast!—won’t know anything is going on down there in the coop? Interestingly enough, what you observed seems to be the accepted reasoning for this behavior. 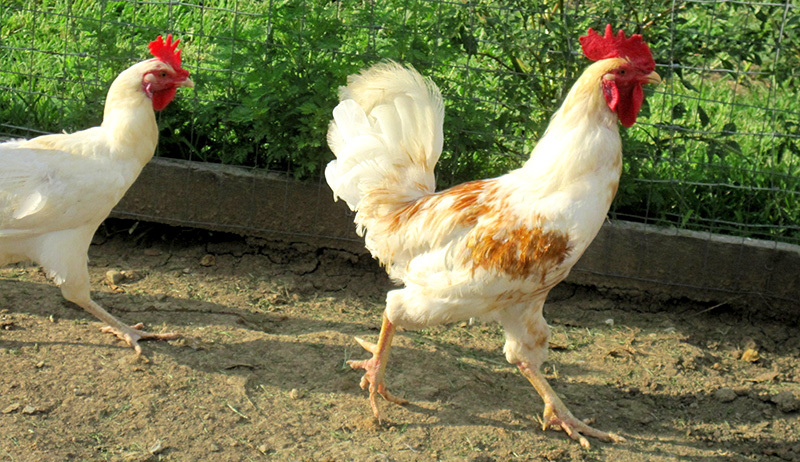 The hen moves away from the nest and makes a racket, thereby protecting her egg by moving away from it and distracting predators by instead focusing their attention on her. Another idea is that the hen, having gone off to lay her egg in private somewhere and assuming in that 30 minutes or so that the rest of the chickens have wandered away, is calling to the rest of the flock to rejoin them. It’s sort of like the chicken version of Marco Polo. Q: I only have a few chickens, but I see large feeders in the feed stores and wonder if it’s OK to fill such a large feeder. Will my chickens overeat? 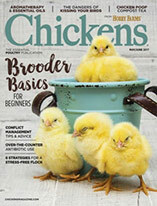 A: No, your chickens won’t overeat their feed. They self-regulate, meaning that they will stop eating as soon as they have gotten all the energy and nutrients they need. So you can fill the large-sized feeder and leave feed out for them on a continual basis. That’s helpful if you will be away for a few days or even a week or longer to be able to fill a feeder and waterer and not worry that your caretaker might forget. As long as rodents and moisture don’t get into it, feed will last until your flock eats it. 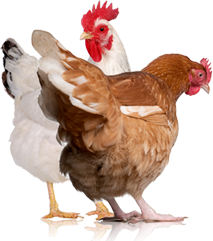 A chicken will eat about 1⁄2 cup of feed a day, so if you wanted to continue to measure out daily feed for them, that is a good rule of thumb, but it will need to be adjusted based on the time of year and the amount of free-ranging your flock does (i.e., what else there is for your chickens to eat).